Posted on April 27, 2011 at 08:22. 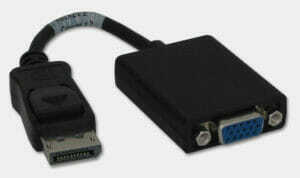 In 1987, IBM introduced the VGA connector, which has become the universal standard for analog video connections to monitors and touch screens. 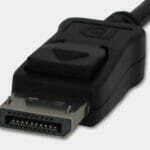 In 1999, DVI was introduced and has likewise become the standard for digital video connections to monitors and touch screens, even though it was never fully adopted and almost all displays can still support analog VGA. But times are changing and by 2015 both VGA and DVI are planned to be replaced by DisplayPort by many tech manufacturers. DisplayPort is the new rising standard in digital video connectivity specifically designed to replace VGA and DVI connections. Hope Industrial Systems is working to stay ahead of the curve during this transition so when your needs change, we’ll be ready! We will be carrying monitors using DisplayPort in the future but until then, we want you to know that new computers utilizing this new technology will continue to work with the Hope Industrial monitors and touch screens you already own or plan to purchase in the near future. Through the use of widely available adapters for converting DisplayPort to your existing VGA or DVI monitor connection, we have thoroughly tested every one of our monitors and found them to be fully functional with the new display connection. If you go searching for these adapters, you’ll find quite an array of them. 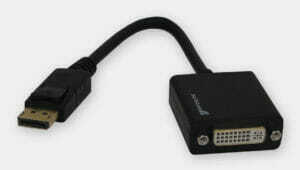 DisplayPort-to-VGA adapters actively convert the digital DisplayPort signal to the analog VGA signal with active circuitry built right into the connector. DisplayPort-to-DVI converters use two different techniques: active and passive, which will either actively convert the signal to a higher grade signal (primarily for high definition TV’s and theater systems, again using active circuitry) or simply pass the already digital signal from the DisplayPort to the DVI connection in your monitor or touch screen. However, in our extensive testing we have found that unfortunately, not all DisplayPort adapters are created equally. These adapters have to obey the standards of multiple protocols (VGA, DVI, and DisplayPort) when converting the data stream. This means the quality of the product is only as good as the manufacturer’s dedication to the applicable standards. Of the models we tested, we found Accell’s Ultra AV DisplayPort to VGA Adapter and StarTech’s DisplayPort to DVI Video Adapter Converter to be two excellent solutions. In repeated tests, both of these units provided very trouble free and reliable operation. If you are using an off-the-shelf adapter (with our displays or any others) and find yourself unable to set your monitor’s resolution to the one you want or need, your best bet is to get a more reliable adapter. Rest assured, as your preferred supplier of Industrial Monitors and Industrial Touch Screens, Hope Industrial Systems is here to help you adapt to this changing tide of technology. We tried a Display Port to VGA connector, brand name “Monster”, from Frys and it did not work. We could plug in a DVI from computer to the HIS screen and it would go to the right resolution, then plug back to the Monster connector and the resolution would revert to the undesired res. We needed to connect from the computer Display Port, so went Display Port to HDMI cable up through the tube to the monitor, then used a HDMI to DVI in the screen box.